Over the last few weeks I’ve researched the wine industry for my chapter Wine and Water. I’ve found many wineries list some sort of sustainability plan and/or third party certification. But sustainability plans or third-party certification are unequal in their ability to protect diminished water tables and water quality. I contacted a third-party certification non-profit organization listed on several winery web sites. I asked a representative if a wine label can become certified and continue the use of chemical pesticides and synthetic fertilizers known to pollute waterways. I asked about one particular wine label they certified (distributed in every retail outlet of wine in the country) who writes on their website under the heading sustainability, “we only spray pesticides and use synthetic fertilizers when necessary.” Could that not be said of any conventional farm, I wondered aloud. “A farm can use pesticides or synthetic fertilizers as long as they keep it out of the waterways,” she answered. Our conversation ended shortly after I asked her how. Benziger Family Winery located in Sonoma County, California is showcased in my upcoming book Eat Less Water. They farm using biodynamic and organic farming methods and purchase additional grapes from 40 grape growers who participate in their Farming for Flavor program. Farming for Flavor is third-party certified by Stellar Certification, the organic certification arm of Demeter Biodynamic. Certified growers meet a comprehensive set of standards which incorporate organic farming methods which drive the root systems deeper and increase organic matter in the soil. Increasing the organic matter in the soil (SOM) can absorb water 10 to 10,000 times more than soil without SOM according to the USDA National Resources Conservation Services. If all soil was active with organic matter the NRCS estimates soil erosion would drop by 72 percent, saving 35 billion dollars in soil every year. U.S. cropland loses 30 percent of its soil from erosion, soil swept away into our water and air. Farming for Flavor certification requires farmers to cultivate their land for organic matter without chemicals. This reduces water pollution and decreases water draws from diminishing water tables. This is a certification designed to protect the land, soil and water. And the reward is superior grape quality. 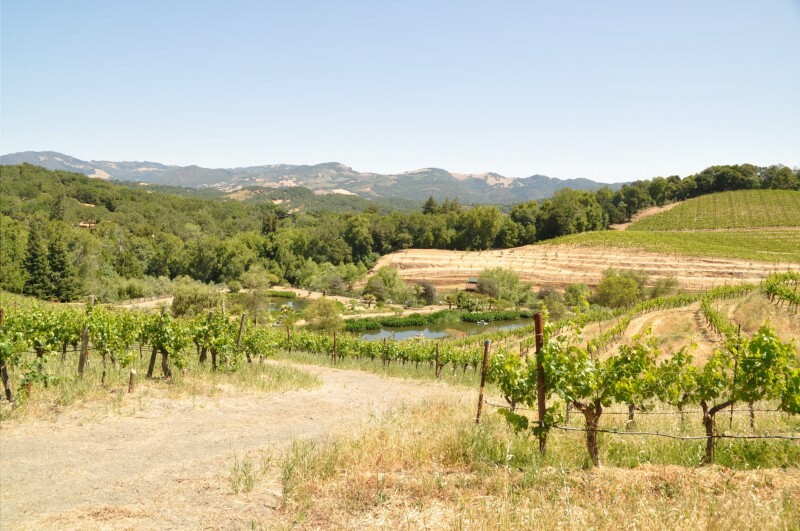 Sustainability on vineyards needs to dig deeper than their wells. I shop for the wine labels with a third party certification I can trust to protect the integrity and abundance of water. Eat less water at your kitchen table. Why eat tomatoes in season? As a wine blogger and as an ecopsychologist interested in water and wine and sustainability, I have to admit I haven’t thought deeply enough about water and wine. Wow. Thanks for this.